Ask a Yogi: 3 things for someone new to YogaGlo to keep in mind as they take their first class at home? You’ve practiced with them on YogaGlo. You’ve followed them on Facebook. You might even take their classes in person once in awhile if they travel to or live in your city. But how well do you know our YogaGlo teachers? Ask a Yogi is back so you can learn more about our teachers by asking questions you’ve always wanted to ask. 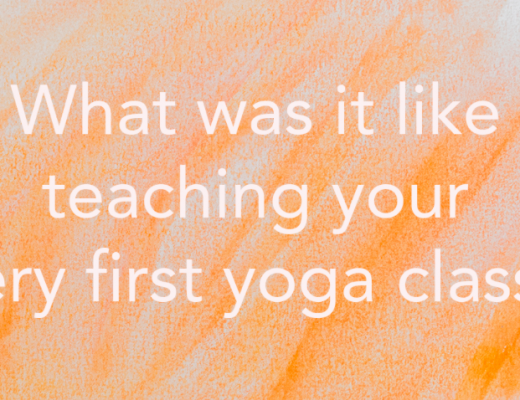 From favorite poses and tips for beginners to deeper questions about how their practice has changed their worldview, our teachers will collectively answer a new question each week. If you have a question you’d like to “Ask a Yogi” let us know in the comments and we’ll add your questions to the list. 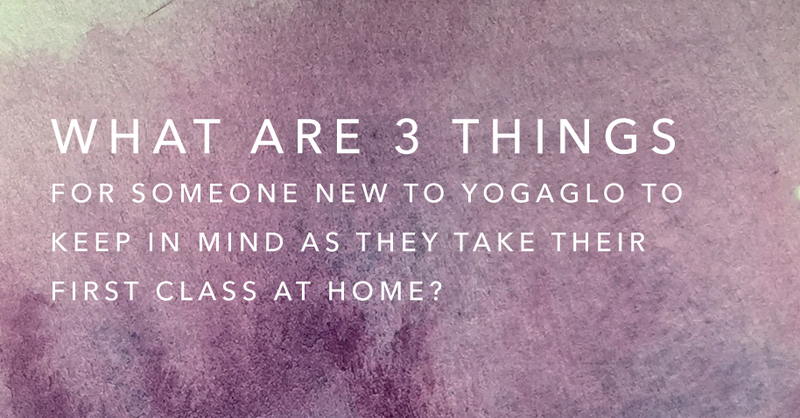 3 things for someone new to YogaGlo to keep in mind as they take their first class at home? Alex van Frank: Three things to keep in mind as you take your first class on YogaGlo at home: 1. Remember to use the pause and rewind as many times as you need. This is your practice and you can take it at your speed. 2. Be more concerned with how the movements and poses feel rather than how they look. The same posture can have many variations because of the many variations of the human body. 3. Accept yourself as you are in this moment without judgment of ‘good’ or ‘bad’ –it just is. When in doubt take a gentle approach to your mind, body and spirit because in the end this is really about creating a positive space in both your body and life. 1. Be patient. For some it can be challenging to focus and pay attention when practicing yoga on your own verses with a group in a studio. But if you can stay focused and stay with it, you will reap all the benefits of the practice and teachings from our YogaGlo faculty! 2. Start out with shorter duration practices (5-20 minutes) until you are naturally craving longer practices (30-90 minutes). 3. Create some ambiance in the room where you do the practice so you make the practice feel like a special time in your day. You could dim the lights or light candles. Carole Westerman: Our personal situations are so different. It’s much easier in some cases to take a yoga class at a studio. There’s a teacher there and a community of other yogis to support you. But for some of us, it’s much easier to do it at home if you have childcare issues or transportation issues or schedule issues. In some ways it’s much harder to take a class at home when nobody is there to keep you on track, or keep an eye on you and push you to your limits. It can be easy to hit “pause”. Not to mention, you have your everyday life there to distract you; laundry, kids, cleaning, emails, pets, etc. Believe me, I know all about this. But, you know what. I think there is value in learning how to tune all of that out, and to learn how to practice at home. When I practice at home I hide my phone. I put my own needs as a priority. I give myself at least 30 minutes to not be distracted by anything. I teach my kids and partner about the sacredness of that time. From my own personal experience, I hate to admit, but I took some extended time off yoga due to an injury from a car accident. And I was so afraid to take a yoga class because I didn’t know if what they did would hurt me. Thankfully, I had YogaGlo. Because I could take classes in the comfort of my own home, without worrying about anything else. I could literally choose classes that fit my needs, time constraints, and preference of teacher. And I could give myself space to take breaks and heal my injury. And while I still pinch myself to think I’m part of the teaching faculty, I also thank my lucky stars that I have this resource for my personal practice. I remember the days of spending thousands of dollars to study with the teachers on YogaGlo. And now they are available at the touch of a button. We are truly blessed! Darren Rhodes: Start with a class duration that you can do on a regular basis; one that fits into your schedule. Sample a wide variety of teachers and styles so you find the optimal fit for you . Elena Brower😕 ?Turn your phone off, relax your mind and allow your teacher to guide you. I love taking class with my teacher on YogaGlo and find great strength in learning there. ? Felicia Tomasko: 1. Be kind to yourself. While we look at other people teaching and practicing to model poses and we hear the instructions about where to place our body externally, yoga really is an internal practice. The poses and shapes and practices guide us into an internal experience. So as you are practicing, be kind to yourself. 2. Practice with the body that you have right now. I often say this in class and remind myself of this instruction every time I do my own practice. Don’t practice with the body you had in your dreams last night, the body on your vision board, the body you had in high school (unless you are in high school but still practice with today’s body). When you practice with this body, in whatever state it is in right now, with kindness, then the practice can support you, where you are right now in this moment. 3. Do less when you need to do less, do more when you need to do more. This builds on my other two pieces of advice and relates to practicing with the body you have right now. The instructions we receive from a yoga teacher are a guideline, not an absolute. It’s always okay to back off and do less in a pose, to come out of the pose, to shift a pose, or to do “more,” whatever more means in the moment. Just adjust the instructions of the pose to fit the needs of your body. Giselle Mari: 1) TRY ALL the teachers. We all have our favorite people and things in life, but nothing teaches you more than expanding your circle. 2) Distractions can and do happen while practicing at home. Try and minimize them as best as you can (turn off the phone, computer -anything that can “ping” you out of the practice. Wait until child(ren) are napping or in bed for the night. Ask spouse and other family members to give you this time or join you. 3) Practice like no one is watching. Let go, have fun and enjoy the process that is your practice and listen, listen to your body and sensation. Kia Miller: You are in for a treat! Yoga in the comfort of your home! 1) Try a few different teachers and styles 2) Try practicing every day for one week, getting in a rhythm will be helpful 3) Have fun! Steven Espinosa: Do the best you can. Rest when you need it. And most importantly, have fun. Yoga is supposed to an enjoyable experience and should feel good. The rest will come with time. Tara Judelle: Learning anything for the first time, or adjusting any learning to a new environment takes time. Let yourself have time to figure out where you place your “home studio”, enjoy assembling your props, and taking into your own hands the creation of your home studio. Even if that studio has to be rolled up and put away. Let go of making sense of each thing at the moment you meet it. If the words or actions are unfamiliar, remember learning any new language takes more brain cells when it is new and unfamiliar than when you know it. As your mind adapts to practicing in this way, you will notice that the intimacy and flexibility become incredibly personal and that you actually have available to you a super studio at your fingertips. Taylor Harkness: Make it sacred. Turn off distractions, light a candle, do whatever you have to in order to honor this time you’re setting aside for yourself. Don’t let it be interrupted. Props are your best friends. Use them to modify poses and support your practice. Blocks, a strap, a blanket, a bolster– they’re all there to help you. Explore their countless uses. YogaGlo has so many classes. Use the filter option to select the right one for you. Explore different styles, various teachers, and gauge your energy. Feeling chill? Wind down with some restorative. Feeling upbeat? Play in some Vinyasa flow. Enjoy. Tias Little: Three things to keep in mind as you take your first class on YogaGlo at home: 1. Remember to use the pause and rewind as many times as you need. This is your practice and you can take it at your speed. 2. Be more concerned with how the movements and poses feel rather than how they look. The same posture can have many variations because of the many variations of the human body. 3. Accept yourself as you are in this moment without judgment of ‘good’ or ‘bad’ –it just is. When in doubt take a gentle approach to your mind, body and spirit because in the end this is really about creating a positive space in both your body and life. Tiffany Cruikshank: 1- don’t wait, just find something you can do now that you can commit to whether that’s 10mins a day or 60mins a week, 2- find a teacher you click with, we have so many excellent teachers to choose from, each with their own unique talents. 3- Just do it! And have fun! 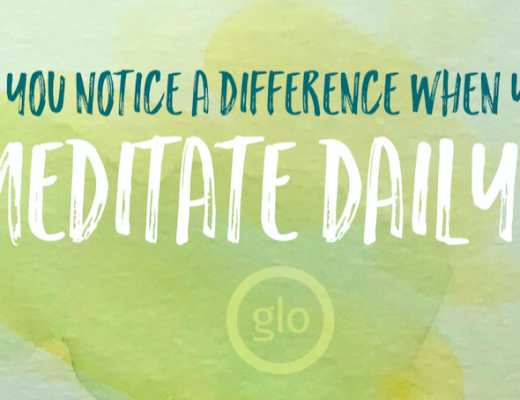 What Happens When You Meditate Daily? 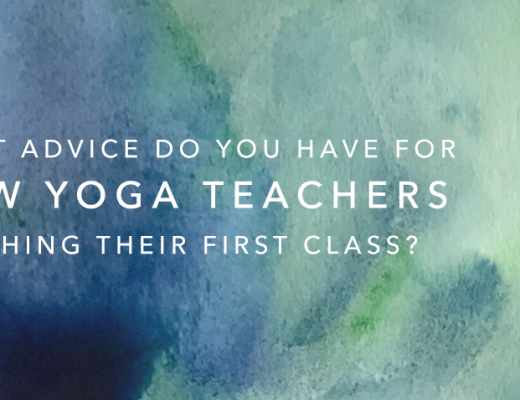 Ask a Yogi: What advice do you have for new yoga teachers teaching their first class? Ask a Yogi: What was it like teaching your very first yoga class?